Empress Theodora--No, Not that One! There is, of course, an Empress Theodora who is fairly well known. She was the wife of the Emperor Justinian, a powerful and influential politician whom some sources refer to as co-ruler of the Byzantine empire with her husband. That Theodora was born around the year 500 and died on 28 June 548. I thought today I'd post about a less-well-known Empress Theodora, this one the co-empress, with her sister, Zoe, for a brief period in 1042, then the empress regnant of the Byzantine Empire from 11 January 1055 until her death on 31 August 1056. As historian Lynda Garland notes, "Historians, like her contemporaries, have tended to ignore Theodora, but she was still a force to be reckoned with. . . ."
Eudokia, Zoe, and Theodora were the daughters of the Emperor Constantine VIII and his wife, Helena--who was described as a woman who was "not only beautiful but also virtuous," who "bore [her husband] three daughters," and who then promptly died. Zoe had a couple of bad experiences in the marriage market--her first proposed husband, the Holy Roman Emperor Otto III, died while Zoe, then twenty-three, was on her way to marry him. Her second proposed husband, another Holy Roman Emperor, turned out to be only ten years old, while Zoe was fifty. Luckily she discovered that before she headed off for the marriage. But when Michael V was dethroned in April of 1042, Theodora was removed from her convent and proclaimed as co-empress with her sister. No one had been in favor of Zoe's sole rule as empress regnant. In this brief summary, I have skimmed over the surface of Zoe's very complicated personal life--no one seems to have cared for her, least of all her husbands and her adopted nephew, each one of whom thought she was trying to kill him. But Theodora proved a strong political figure--not least in her dealings with the dethroned Michael V, whom she had blinded and forced into a monastery. Her relationship with Zoe was not a good one, either: Zoe was jealous of her younger sister and though she was not really interested in the task of governing, neither did she want Theodora to have power. But Zoe managed a coup after seven weeks of joint rule, and in June of 1042, she ousted Theodora, allying herself with Constantine Monomachos, whom she married in November, elevating her new husband to the role of co-emperor. On this occasion, Theodora managed to remain in the palace. Also in the palace was Constantine's long-time mistress, Skleraina, who herself had "political dreams." She was officially recognized as sebaste, or "Augusta." Although there were popular suspicions that Constantine and Skleraina were plotting to do away with Zoe and Theodora, the four seemed actually to live together quite amiably. Whatever Constantine's plans might have been should his much older wife die, Skleraina died in 1045, and Zoe lived on until 1050, dying at the age of about seventy-two. 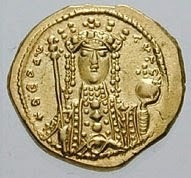 As he himself lay dying in 1055, Constantine IX supported his council's plans to ignore Theodora's rights and turn power over to another contender after his death. Theodora, however, had other ideas. At the age of seventy-five she was able to exert her rights and was proclaimed autokrator, or "emperor," by the imperial guard after Constantine's death on 11 January 1055. Given the many years of her sister's example, Theodora preferred to rule "quite openly taking on the role of a man." As Garland notes, Theodora appointed her own officials, dispensed justice, issued decrees, and gave orders. She dealt handily with rebels. Her decision to appoint clerics riled the patriarch of Constantinople, Michael I Cerularius, but he did not dissuade her from exercising what she believed to be her right in the matter. Theodora ruled as empress regnant for about a year and a half, until her death on 31 August 1056. She was the last Macedonian emperor of the Byzantine Empire. She chose her successor, Michael VI, as she lay dying. For a brief entry on Theodora, from the Encyclopedia Britannica, click here. There is an excellent chapter on this Theodora (as well as on Zoe) in Lynda Garland's Byzantine Empresses: Women and Power in Byzantium AD 527-1204. Garland's book is, unfortunately, very expensive--maybe Interlibrary Loan?